A formal sentencing came today after reaching a plea deal in September. 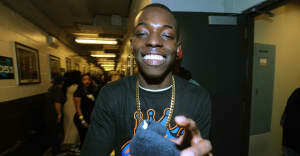 In Manhattan on Wednesday, Bobby Shmurda was sentenced to seven years in state prison for weapons charges he's been facing since his arrest in December 2014. According to multiple reports, Shmurda said at the hearing, "I was forced to take this plea. I do not want to take this plea." "If we made bail I would’ve beat the case," Shmurda said in an interview after reaching his plea deal in September. "We look guilty in these orange jumpsuits. If you put Al Sharpton in a orange jumpsuit and accuse him of having a gun, he’s going to be found guilty." In September, Bobby Shumrda's lawyer Alex Spiro told The FADER that "His sentence of 7 years, with credit for 2 years already served and good time credit will hopefully permit him to be home in approximately 3 1⁄2 years and resume his remarkable career. This plea also covers a separate Bronx Indictment." In an email to on Wednesday, Spiro said he had"no comment other than what I said at the time of the plea." Shmurda could have been facing a 25 to life prison sentence if he was convicted of the crimes of which he was being accused.